Game Balance is a totally different kind of fun compared to old school fun. It's more a fun-nel really, that basically seeks to minimize the parts of the game that old schoolers find fun. Gamers, generally speaking, roll dice because the element of randomness brings a level of excitement to the table. And they applaud creative thinking or player skill being able to make a crucial difference in a tight spot. Because it is fun. Because they are variables making the game more open-ended. Game Balance is the opposite: It is the premise that so long as the party manages its resources properly, they will be guided through a scenario of progressively more difficult encounters, each of which they should be able to defeat in turn and still come out with positive hit points, for a total combat experience that should be neither too easy nor too hard. If the GM knowingly presented encounters too strong for the party, that is seen to be GMing in bad faith. If they are too easy, the GM is expected to make adjustments so that the players can stay within the happy medium of challenging encounters in the Game Balance Funnel. In other words, you can expect to come out on top as long as you stick to the guidelines on both sides of the table. You can roll dice and come up with zany stratagems, but the game is rigged so that the outcome is meant to be a foregone conclusion regardless of these variables. This concept of "game balance" became part of the gaming culture during the 3rd edition cycle and was enshrined into inviolate law in 4th edition. In 3rd edition, the Game Balance funnel was not originally intended to be part of the game. It provided encounter guidelines mostly as an tool for eye-balling Total Party Kill encounters and enabling the GM to steer clear of this if he wanted to. The gaming culture however, quickly began to take the guidelines as a social contract and part of the game. When Wizards of the Coast released adventures that did not follow these guidelines rigorously, there was outcry. They quickly learned not to do that again. The guidelines had become law. In 4th edition, this was taken to its ultimate conclusion. Though the various mechanical widgets players had to choose from were probably more plentiful than ever, 4th edition was so perfectly balanced that it was virtually impossible for the GM to "break the game" (ie, kill the player characters) as long as players and GM alike stuck to very clearly defined guidelines. As part of the this, players also could not break the game either - Each class was designed to be perfectly balanced against each other, giving every player a chance to shine equally. 4e is maybe the most balanced RPG ever made. Character build - with 3rd edition, making a character became a mini-game itself. "Builds", tracking progression from 1st to 20th level, became a thing. The game itself encouraged this sort of fiddling with prestige classes that could be combined in multitudes of ways and whose requirements and optimal benefits required planning ahead many levels in advance. Feats likewise, often required planning chains of them many levels in advance The tone of the game itself shifted, with a greater emphasis on self-actualisation through the character you are building to become over time, than the adventures to be had. Say Player A spends half a day building a character, plotting out how Lazariavilnus the gray elf rogue was going to become a Rogue 1/ Wizard 4/ Daggerspell Mage 10/ Unseen Seer 2/ Arcane Trickster 3 at level 20, meticulously planning assigned feats and skill ranks to get just the right synergies at level X and Y - And then Lazariavilnus dies in fire at 2nd level due to a random encounter with a dragon - Player A is probably going to be unhappy that the GM took away the character he had invested so much time in already - Especially when the GM actually had encounter guidelines that could have avoided this. It is only natural really - Player A invested his time in ways the game encourages - Engaging in the mini-game of character building. What's the point of doing that if you have no assurances that your player is likely to survive to ever see it come to fruition? That Game Balance became expected by players is almost inevitable when you design a character creation mini-game with that kind of investment in it. The other part of the game that lead to this is the increasingly binary nature of encounters in the game. Gone were reaction rolls - Which, though in spirit intended to let GM decide for himself, tend to just lead to more binary outcomes of "Fight or.... fight?". As were morale rolls - creatures were now much more likely to fight to the death. And even more crucially - encounters changed from primarily being obstacles in the path between the PCs and their goal (gold, which = XP) to being the goal itself (XP). Besides the more variable outcomes of encounters in TSR editions of D&D, it also gave ways of attempting to by-pass encounters that were way out of their league, without necessarily compromising their quest for the goal of the game (XP). Contrast this to 3rd and 4th edition, where the combat encounter was enshrined as the ONLY real way to gain XP and thus advance your character - If combat is presumed inevitable and something the players are supposed to seek out in order to advance in the game, it becomes more natural for players to expect that they should be able to survive it. Sure, the party could have just sneaked away from that dragon, but that's not what the game incentivizes. As part of this focus, it is only natural that combat was more developed, and took up more of the game time in a session, in 3e and even more so in 4e. So game balance became the pillar to stand on for the increased focus on the mini-game of character building and the different more combat-focused player incentives offered in the game. Looking to TSR games, and their OSR offsprings, we can see why game balance is mechanically less relevant there and simply not in the spirit of these games. If you and your players refuse to embrace this axiom, you fall prey to an invulnerability that renders all the dangers impotent. You simply reenact plots knowing that the hero always survives and wins ::yawn::. But in accepting it you spring headlong into a world of thrills 'n' chills where failure and death are ever-present possibilities, surmounted only by the now-classic D&D resolution: create another heroic wannabe and try to do better." Secondly, Combat is more avoidable - reaction rolls tend to produce different outcomes. Morale rolls tend to shorten fights. And more importantly, players aren't given strong incentives to look for fights. The real prize is the gold on the other side of the encounter. Why fight a dragon when you can just sneak past it and try to loot its hoard by stealth? Especially if you have doubts that you would be able to survive it. This last part is the clinch in terms of fun - The social contract of game balance means players are simply not supposed to consider if they are able to survive the encounter - the rewards of the game are triggered by engaging in and winning fights and we're supposed to be able to survive each encounter - There should be no choice needed for that random encounter with the dragon - The GM wouldn't put it there if we couldn't defeat it. The world the PCs inhabit is basically solipsistic. It exists only as a level-appropriate response to the PCs and their goals of character advancement. In TSR D&D, fighting is more of a choice - And one you can opt out of without detracting from your primary aims. This also means the GM can put in encounters that the players could not hope to survive if they engaged it in combat. And from there, create a world that is more open-ended - A world which feels less like a solipsistic funnel towards the next combat encounter and more like a world that has its own life independent of the PCs; where combat is but one aspect of the game and whether to engage in it at all is a legitimate strategic decision that the game will not punish you for opting out of. Where achievement is earned and not a foregone conclusion. 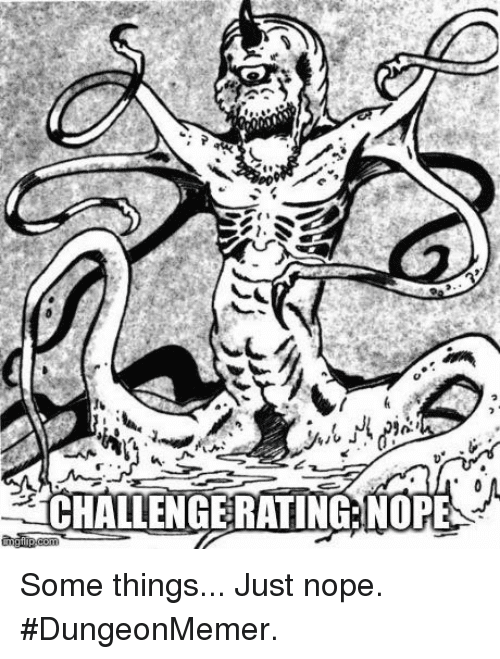 The good GM then, does not go out of his way to set challenges that he knows will not kill the characters. Rather, he lays out meaningful choices for the players; to choose whether to fight the challenge, or look for other solutions to accomplish their goal. 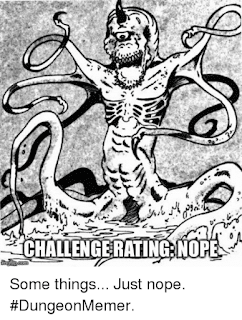 And he leaves it to the players, not the GM, to estimate the "challenge rating" for encounters they come across. The point of this article is not to argue that all those who play pathfinder and 4th edition today are having BadWrongFun. When I played 3.5, I went all in on character builds myself and enjoyed the experience of tinkering with it. It was a fun solo mini-game to engage in outside the group play. And lots of combat can be fun - up to a point. The point is rather to illustrate that when modern players consider older games to be unbalanced - That this is a feature, not a bug. And that this was by design, not accidental. That developments of game balance do not necessarily constitute an evolution of the game, but rather a horizontal shift in focus in terms of what the game wants to be. That there is a different kind of satisfaction in discovering your character in play, as opposed to building it and plotting out its future well in advance. And that being less attached to your character is actually somewhat liberating. That accomplishing your goals without the compulsion towards combat can create a wholly different style of play. And that combat is genuinely exciting - Because you could very well die. It's a different kind of fun to the fun-nel you've been used to. My advice to 3e/4e players wanting to give the OSR experience a shot - Try dying. Come to the session with a folder of character sheets. It won't take more than an hour to create a good handful or more. Just have a basic idea of what that character is right now. And die a couple of times. Get it out of your system. Around that point, you will start to have a good feeling for how to navigate a world of fantasy full of dangers and glories to be had, where the skeletons of adventurers who failed might actually be found in dungeons - And do your best. Doing so WILL affect the outcome. This is a blog about the B/X-style hack of 5e called "Into the Unknown" I am working on, about the Mythlands of Erce, my snowflake setting I am hoping to publish some day, and for my musings about OSR stuff in general.